Tracy Gallagher was the face of the Travel Channel for years – hosting thirty-second primetime interstitials from all over America. Some of her special series and one-offs include: The Short List series, World’s Best series, Islands for Rent, The Best of Rio and Conde Nast Traveler’s Hot List. Most recently, she created, hosted, and produced the reality based family travel series, Are We There Yet, inspiring others to travel the world with young children. She has also hosted What You Get for Your Money: Walt Disney World Resorts on Fine Living Network, and the series Cool Kids Parties on Fine Living. As a travel expert, Tracy offers tips to inspire and help travelers. She lives in Pacific Palisades, Ca. with her husband and three young, very well traveled children. [Photo: Tracy Gallagher with her family on vacation. 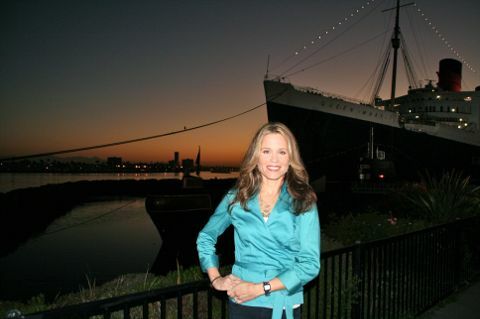 A quick bit about Tracy Gallagher: Tracy Gallagher is one of the most experienced television travel experts in the USA. From 1998 -2007 she was the Travel Channel’s “go to” travel expert and network host. During that time, she hosted several television series and specials and was a regular contributor to TravelChannel.com. Tracy co-anchored the magazine-style daily one-hour strip, Travel Daily, traveling the world collecting stories. She has reported from numerous foreign destinations including Egypt, Portugal, Germany, Morocco, England, Denmark, Hong Kong, Fiji, Brazil, France, Spain, Belize, and the British Virgin Islands. For Travel Daily she interviewed key travel newsmakers and adventurers from around the world. 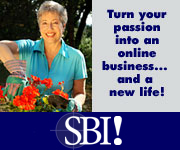 Tell me about your travel blog: My blog, TracyGallagher.com is topical, and geared toward families. Not everything little thing is for families, but with the increase in family travel, and women being the prime decision makers in trip planning, I want to encourage them to think out of the box and don’ t let the kids hold you back - take them with you! 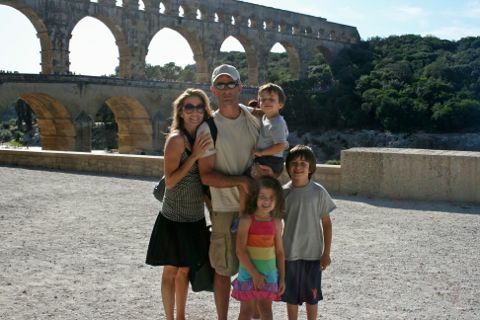 I have traveled around the world with my own three kids, and had a family travel show on the Travel Channel. I try to give good info on how to do that, and where to go. It is topical in the way that I have a news background, so I respond to current events a lot. How old were you when you got your first passport and where did you travel to so you could “break it in? I was barely 21, and spent three months traveling all over Europe. What kind of traveler are you? Budget Traveler? Luxury Traveler? Business Traveler? Wellness Traveler? Voluntourism? Solo Traveler? Backpacker? All of the above. I want to devour every kind of travel. The most recent trip that is worth talking about was a trip to the Florida Keys with the kids - snorkeling, fishing, Key Lime Pie - then up to Miami and on to Disneyworld. I would never just go to Disneyworld. I felt I needed to expose the kids to something authentic to balance the over the top amusement park scene. It was a perfectly planned vacation. Loved Cheeca Lodge in the Keys. There was this Jimmy-Buffett-style restaurant across the street from Cheeca Lodage called Morada Bay Beach Cafe that was special. We dined with our toes in the sand. The tables are right on the beach, and there is live entertainment. Tip: Go at sunset. How many countries have you been to and which ones were your favorites? Boy - I don’ t think I’ve counted! More than 30. I might have to say Morocco affected me because it is so different than Western countries... waking up to Islamic prayer calls throughout the city, seeing how the locals live, the different clothing, the souks, the poverty. How the men there responded to women was a wake up call to how lucky I was to be born in the United States. Are you someone who arrives at the airport with lots of time before your departure or just in the nick of time prior to departure and why? Just in the nick of time!!! I love airports and people watching but my life with three children is full and I try to calculate the last possible minute I can arrive at the airport. What are your top tips for going through TSA lines quickly and with no hitches? Nothing magic. Be prepared: Have your identification out, wear shoes you can easily take off, don’t pack anything that is contraband, etc. What is the one item you’ve discovered that changed your airline travel experience for the better? This may be obvious - a Kindle. Less reading materials to carry on. What are five items you always have in your carry-on and won’t leave home without? Actually - I always just try to fit everything in my carry-on to avoid lost baggage, wasting time waiting for luggage at the baggage, and of course, the fees. What is your best packing tip? Try to pack clothes you can wear from day to evening, then at night simply accessorize differently or add a higher heel. Black is always good. And don’ t forget an umbrella! Are you loyal to travel brands or do you always book the best price and why? I search all over for the best price until I feel there is no longer any value in searching and it has become redundant. I do like getting on airline and website alerts so you are emailed when there are specials to the destination you desire. Also subscribe to their Twitter feeds for updates. What airline do you fly the most and what do you like best about it? What are your three best tips for maximizing travel loyalty miles, points, etc.? 1.) Ladies - make sure your ticket is booked in the same name that is on your reward program. For example, my frequent flier program on a certain airline is my professional name - my maiden name - and I opened that account before I was married, but also producers who were booking my travel knew my professional name. On a personal trip, my husband booked the tickets under my married name, so I didn’t get credit for the miles, even after showing identification at the gate and calling the airline. I had to send in a marriage certificate to show proof of my name change. That cost me some time and the miles hadn’t posted at a time I needed them to book another flight. 2.) Follow the expiration dates closely! 3.) Always, always, always ask about airline partners. For instance, I had many miles on American, but there were no eligible seats using miles when I was taking my family to Paris. Luckily, I called and got an attendant who cares - she suggested we fly Air Tahiti Nui to Paris since they are a partner of my airline! I didn’t even think of that airline going to Paris, but Tahiti was a colony of France and that is the language still spoken there. What’s your best loyalty rewards story or the best travel deal you ever got? Since I travel a lot for work, I am not privy to many of the trip’s costs... however my one personal deal I can think of is not nearly as good as Marianne’s ($99 R/T First Class to China). Round trip flight to Tahiti from San Francisco with seven nights at two different 5-star hotels on different islands, all transportation costs for $1200. Getting to and from Tahiti and with island transfers is generally very expensive - with airfare alone going for $1400. Today I’ve seen similar packages for $3000 or more. What’s the biggest challenge in finding a fun and compatible travel partner? Hmmm.... I think the challenge is not only finding someone who is fun and compatible, but available to take time away the same time you are! I think you know when a person would be someone you could be compatible with or not. When you travel to a country where you don’t speak the language, do you learn key phrases, carry a phrase book, or learn the language before you go? I absolutely try to immerse myself in the culture of wherever I go. Depending on the language, in other words - if I think I will use it more than just once, I use Rosetta Stone language learning systems. I speak two other languages besides English, but not fluently, so for those languages Rosetta Stone REALLY improved my skills since I already had a base. Sometimes to communicate I go to a common language between us if we each don’t speak each other’s native tongue. What’s the first thing you do when you get to your vacation destination and why? It really depends on what time I arrive, what the weather is like, if I am staying in a home or a hotel or a tent, etc. But I definitely map out the things I definitely want to see and do in the trip within the first four hours. Describe your most memorable travel food experience ever. I am lucky to have been to numerous amazing restaurants - my favorite food towns are still Napa, Sonoma, and San Francisco - but honestly the most memorable meals are the times when locals have invited me into their homes. One publicist of a Paris hotel had us over for dinner - not in the hotel’s dining room - but in her tiny apartment and insisted upon making me dinner. Her hospitality and generosity made it a special evening. I also learned a lot about the way the French eat - she didn’t have one can of food in her cupboard. She made daily trips to the local market to make sure everything was fresh. What’s your favorite souvenir to bring back from a trip and why? Shells - if it’s a beach vacation and it’s legal... and then whatever I see that reminds me of the place I visited. Of all the places you visited, choose one that changed the way you think about life or history… Dachau concentration camp. I sincerely want to thank my colleague, Tracy Gallagher, for taking the time to share her travel pearls of wisdom. Don't forget to follow Tracy on Twitter @TracyGallagher.